Skulduggery is a snarky, wise-cracking skeleton detective. He meets up with Stephanie at her uncle's funeral and the two are off on an adventure full of magic, secrets, and lots of humor. This has become my go to series for anyone looking for a great read. I've booktalked it to tweens, teens and adults. I've gotten all our children's librarians addicted. I gave these books as Christmas gifts this year. Seriously, this is a must read series!! With as much as I love this series, you can imagine my delight when author Derek Landy agreed to answer some questions on my blog! Welcome Mr. Landy! GreenBeanTeenQueen: Is Skulduggery's character and personality based on anyone or is he all from your imagination? Derek Landy: Skulduggery is, basically, a smarter, more competent version of me. We’re very close in terms of how we see the world and how we see people, and we also share a knack for making jokes at VERY inappropriate times. Valkyrie is also based on a real person- she’s based on a very good friend of mine. The real Valkyrie is a few years older than the one in the books, but whenever I start to wonder what Valkyrie Cain would do in a certain situation, I just have to think of my friend and then I know the answer. GreenBeanTeenQueen: I know Skulduggery's birthday is coming up this month. What is on his wish list? Derek Landy: Probably a rescue mission…! At the end of The Faceless Ones he was left in quite a predicament, so I’d say he’d be wishing really hard for someone to come help him…! 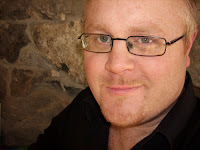 Derek Landy is visiting more library blogs all this week. Read more about him and about Skulduggery Pleasant at these great blog sites: Essex Library Teen Space, Library Lounge Lizard Blog, Read Kiddo Read, and Wondrous Reads. Seriously, read these books!! It's my librarian mission to spread the Skulduggery love-so go and read them-you won't be dissapointed! Loved the first two...I'm waiting to read the third! I think Valkeryie is awesome and I find Skulduggery very funny. Good adventures! I just wish that they had used the "Scepter..." title for the first book from the beginning. It was confusing when they issued it as paperback with the subtitle...I thought it was a new book in the series at first! How was the audio version? Yeah, I think the title change is confusing too. The audio is AMAZING! The narrator rivals Jim Dale as my favorite audiobook narrator and there are fun little sound effects and music that make it a great listen. I Have Read The First Three And I Am Dying To Read The Others!! I'm Obsessed With The Series!! "Lots of clever little things"
Not an hour goes by when I'm not thinking about it, which is really unfortunate because I'm in the U.S. And no ones ever heard of it...!